They Were Amazed She Could Read So Well At Such A Young Age. This teaching method uses all of the 3 different modes of learning – seeing, hearing and touch. If you learn using the three modes of learning you will learn faster because the three modes help plant what you are learning in your brain. Most classroom teaching is a visual - hearing based system with very little touch or movement involved. The Montessori Method uses all three modes of learning and that is why it is so effective. If your children are struggling with reading then bring out the sandpaper letters and the phonics and watch your child’s reading and writing improve. Phonics are a must for struggling readers because phonics help match the spoken word with the written word. And in most cases a reading problem is a phonics problem. So bring in the phonics and the sandpaper letters and reading problems just seem to disappear. The video is about how to make sandpaper letters. They are not all the difficult to make and after you have made a few the rest are easy to make. I recommend just making a few each day. Make up the sandpaper letters you need for that day's lesson. This video will take you through the steps needed to make a sandpaper letter. You will start by printing off the letter from your computer and end up with a sandpaper letter. Then you will be guided through a series of lesson plans showing you how to make sandpaper letters and then how to use them. After you are comfortable with the lesson plans you are introduced to ‘The Four-Step Process’ that you can use to teach your children any words they need to know from what they are learning at school. They are just little things you can do to make teaching reading more enjoyable for you and your child. Also there is a downloadable section that you can print off from the internet. Here you have phonic charts and phonic lists as well as templates for the letters and also word lists. The letters are in cursive not in block so you can teach your children to write beautiful hand written words and sentences. 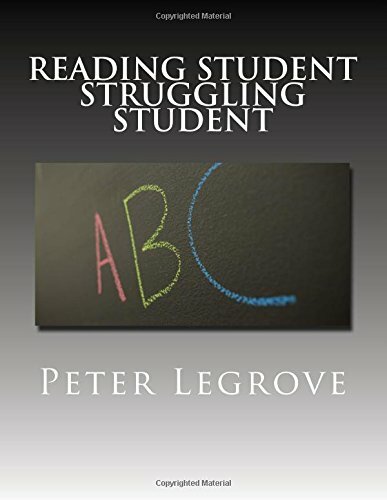 The idea behind “Reading Student Struggling Student” is to get your child to read and we will do whatever it takes to get your child to read. Yes. I want to help my children get into the top 10 in their class. Yes. I want to take control of my children’s education. Yes. I want my children to be able to read better. Yes I want my copy of the manual "Reading Student Struggling Student"
All the best teaching your children. P/S: To give your children the leading edge at school. And to give them a self-confidence and self-esteem boost Order Now from Amazon and start your children on the road to lifelong learning.